What is supposed to be a public institution devoid of partisanship is gradually being turned into an avenue reserved solely for members of the ruling National Democratic Congress (NDC) who have grabbed juicy appointments in the establishment relegating technocrats to the sidelines. Currently all top positions at the National Identification Authority (NIA) have been assigned to family members or relatives of top guns in the NDC creating anxiety in the sensitive organisation. For instance Marco Mensah who is the Head of Operations is the junior brother of Sylvester Mensah, Chief Executive Officer of National Health Insurance Authority (NHIA) and a member of the NIA board; Osei Kwame Griffiths, son of Commander P.M.G Griffiths, a Deputy Minister of Communications in the erstwhile Rawlings administration and a current member of Ministerial Advisory Board for Ministry of communications is in charge of ICT at the NIA. A brother of Kwame Peprah, former Finance Minister and currently Board Chairman of SSNIT is the Head of Administration while the son of Dr. (Mrs.) Christine Amoako-Nuamah a presidential advisor and Chairperson of the GIMPA Council is in charge of the Human Resource Department. Under the law a Minister of State is not supposed to be a board member of any state institution unless explicitly indicated in the enabling law, but E.T. 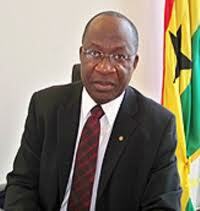 Mensah, Minister of Employment and Social Welfare is still enjoying his membership of the NIA board. Daily Guide has learnt that Osei Kwame Griffiths is temporarily residing at the premises of the NIA located at Gulf House near the Tetteh Quarshie Interchange in Accra. It is alleged that NIA contracted Ernst & Young, a professional services firm to draw a strategic business plan aimed at identifying areas where NIA could generate funds internally but before the plan could be submitted for discussion and approval by the government, the management of the authority entered into a contractual agreement to produce identity cards for private organizations and individuals. A source said when the Ghana Statistical Service (GSS) whose boss is NIA board member, requested the Authority to produce ID cards for field staff conducting the 2010 Population and Housing Census (PHC); the NIA sublet the contract to two private companies to produce the cards at the cost of GH¢ 169, 280. Interestingly, the private companies: Decision Link based in Kumasi and Universal Asid Systems in Accra were said to have used facilities of the NIA including vehicles and offices to execute the business raising questions about the rationale behind engaging private firms for the job. He said due to the alacrity with which the company executed the contract, the NIA decided to involve the same company to produce ID card when the GSS approached the authority. On the question of relatives of top NDC gurus getting juicy appointments at the NIA, Dr Ahadzie said he could not answer for that and asked Daily Guide to conduct its own investigations. On the issue of ET Mensah as a board member and Minister of State at the same time, Dr Ahadzie said he (ET Mensah) was on the board as a representative of Parliament as the law stipulates. I find it very laughable when people in public institutions behave as thought they operate in a vacuum. This was my reaction when I read Marco Mensah's rebuttal on myjoyonline.com. The NIA act came to being on 18th April 2006, and immediately, some members who were with Prof. Dumor at the EC moved to NIA, a mist protests from the EC, to the extent that most people at EC felt they were betrayed by the action of those who followed Prof. Dumor to NIA. He(Marco) left EC to NIA. In any case, the main structures of NIA only came out in July 2010, that was when he, Marco was made head of operations, not acting. The work involved the zoning of the country to enable undertake the exercise by 2007, All the zoning are based on the EC's data, visa vis, electoral centers, what type of experience does one need to replicate an established data? NIA started its real work which involves collection of data of citizenry throughout the country in July 2008, and up to date, only six out of 10 regions have been covered. The talk of technocrats, yes if he thinks being knowledgeable in elections is the same as an identification system, please someone educate him. Even the way that the project for over two years has been managed is a clear sign of lack of in depth understanding of basic, I mean basic principles in project management, which if he had that experience, I don't think he would be sitting in that office. Of course He got appointed to his current position in 2010, a year in which NDC is in power. Does he think things are being run as they are supposed to be at NIA? and thus calls himself a technocrat? Please NIA has nothing to do with elections, monitoring or otherwise, but for that , I don't see any experience that would bracket him as a technocrat. Yaw, u can go investigate these allegations and republish this in anyway you want it, just drop me a mail when it is going to press so I can get a copy to read. Another recruitment has gone on recently, you can find that one out too. My brother you are not far from right, in fact you are very right. They have done another recruitment, another cronies and foot soldiers association etc, etc. At least in 2006, they were asked to joy irrespective of their political affiliations so why have they decided to alter the way things used to operate? or are to operate?